Get in touch with nature at Atherton Tablelands and Scuba & Snorkeling. You'll get in some beach time at Four Mile Beach and Palm Cove Beach. 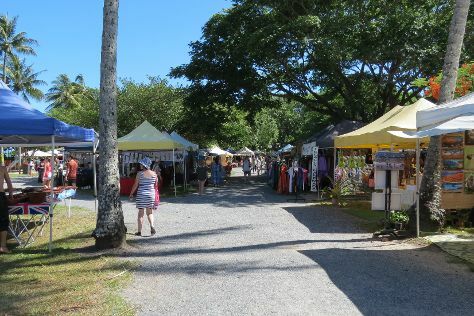 Explore the numerous day-trip ideas around Cairns: Sunday Market Port Douglas (in Port Douglas), Hartley's Crocodile Adventures (in Palm Cove) and Kuranda Candy Kitchen (in Kuranda). There's more to do: zoom along the surf with a waterskiing or jet-skiing adventure and whizz through the canopy at some of the top local zipline courses and adventure parks. To see photos, reviews, ratings, and tourist information, go to the Cairns trip itinerary planner. If you are flying in from Hong Kong, the closest major airport is Cairns International Airport. In January, daily temperatures in Cairns can reach 36°C, while at night they dip to 28°C. Finish up your sightseeing early on the 12th (Thu) so you can travel back home.